Yi 360 VR has officially launched in the US at $399. A Yi representative previously said the price would be $499 and that was the price shown on Yi’s store on Aliexpress, but the actual launch price in the US is $399. The other thing that’s now been confirmed is that there is no built-in image stabilization, despite lingering rumors to the contrary. 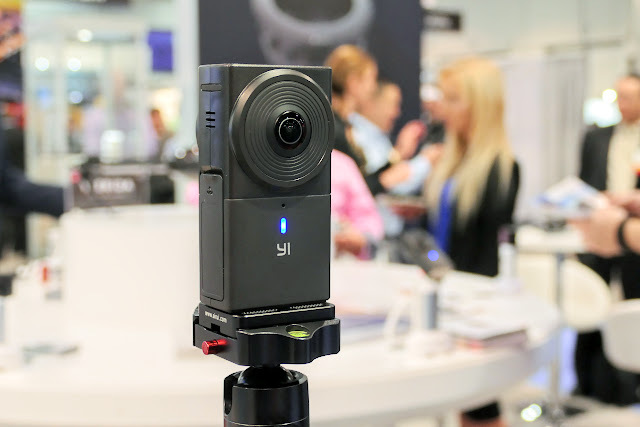 Nonetheless, the Yi 360 VR costs a few hundred dollars less than other 5K+ 360 cameras — namely the Garmin Virb 360 and the soon-to-be-released GoPro Fusion. With the price difference, you’ll be able to buy a 360 gimbal such as a Guru 360 gimbal, or a Feiyu G360, and you may be able to use the gimbal with your other cameras. Moreover, a gimbal has better stability without blur, compared to built-in stabilization. As always, you don’t have to take my word for it. You can instead see for yourself using the 360 Camera Comparison page. I found that it was more detailed than the Theta V and had much less purple fringing and flare. Compared to the Garmin Virb 360, I thought the Yi 360 VR had about the same detail, but better stitching (when stitched on a desktop), less flare, and slightly better shadow range. The big unknown for image quality is how it performs against the GoPro Fusion. So far, beta testers of the Fusion have been very impressed with its image quality but as far as I know, no one has compared the Fusion and Yi 360 VR directly yet. I do have the Fusion on order and it’s supposed to ship by November 24. As soon as I receive it, I will definitely compare them both. In the meantime, if you want to order the Yi 360 VR, it’s now in stock at Microsoft stores. It’s also available for order from B&H Photo (but B&H is not yet showing it in stock). Any news / rumors for the UK release date? Good that has become available in the US at $399! Hopefully equivalent cost will carry over to the UK. The YI shopping link carries over to AliExpress; have heard mixed comments about them as a supplier; before went ‘out of stock’ was offering shipping from Germany which may prove an option? They are expected to process the order before the end of November, will update you on whether they follow through or not. Many thanks be interested to see how you get on! I’m in the UK and have just ordered one from Aliexpress. Shipping estimate is 20-40days from China. Here’s hoping it’s closer to 20! I’ll report back when it arrives. Been testing some of the footage that had been uploaded to Dropbox by a user on Facebook; un-stitched 5.7k and computer seems to cope with stitching & editing, which was the other concern! Had another look at AliExpress and there was one left so decided to order it! Says 5 days processing then the 20-40 days delivery, like you hope will be closer to the 20! Have had smaller items arrive fairly quickly from China before, this is the first ‘big’ item have purchased. Great news! I borrowed a Virb 360 and took it to the anime convention Youmacon in Detroit. Looking at the video in 5.7K on my Rift is amazing! I would like a 5.7K camera of my own without breaking the bank and the YI look so good. I tend to leave the camera on a monopod so stabilization has not been an issue. It would be nice to do 360 tours/walkaround videos but I’m happy with my current people watching videos. I just had a chat with B&H and they said that they still haven’t received any stock of the YI 360 and they don’t know when they will receive any. Kinda bummed me out. Hi Trevan. Yes a bit disappointing. Well I went on the microsoft store and they had it in stock so it turned out ok. I hope that everyone appreciates that it was I who forced Yi into releasing their 360. As soon as I placed an order for the Mi Sphere after waiting all these months for the Yi…. whammo they released it. (Hehe). Anyway, I placed an order for the Yi through the Microsoft Store. Got a shipping notification about 17 hours later. So I’ll have two 360 cameras. Besides my old, old Kodak 360. Is there software available for 360 video that copies what you can do with Insta360 One’s Free Capture? Possible to compare the Rylo vs this? How is the Yi 360 in terms of manual photo controls? Can you manually set things like shutter speed/aperture/iso like on the Theta/Mi Sphere? Thanks Andres. Yes you can set ISO and shutter speed (but manual shutter speed is only for longer than 1 sec, so it’s only for long exposures). Aperture is fixed like Mi Sphere. I picked up my Yi 360 on Saturday from Microsoft. (I had to drive over to Cerritos since all the closer LA stores were out of stock). My Yi also recently updated to now support voice commands. Sweet! Regarding workflow, what PC/android apps do you use/recommend for stitching/editing these 5.7k files? Are there free or low-cost options? I too would like to know which editors can output 5.7k 360 video renders. My Powerdirector 16 reads and edits Yi 360 5K videos fine. But as far as I can tell, will only render to 4k.